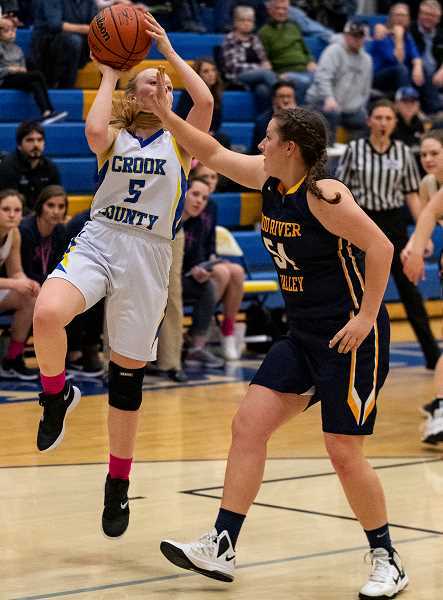 The Crook County Cowgirls used balanced scoring and tough defense to pick up a hard-earned 41-39 victory over the Hood River Eagles Friday night in Prineville. "It was a good win," Crook County head coach Heidi Lea said following the game. "Our girls knew that this was a winnable game for us if we did what we needed to do. So, it was good. They practiced hard and they played hard. To get that win, that was big." Crook County fell behind early when a Dani Valle basket gave the Eagles a 2-0 lead. Crook County led briefly midway through the first quarter but were outscored 5-0 the final four minutes of the first period as Hood River Valley took a 10-6 lead at the end of the quarter. The Cowgirls quickly came back in the second, outscoring the Eagles 16-7 in the period, largely on the hot shooting of Teagan Freeman, who hit eight points in the stanza. The Cowgirls led 22-17 at the half, but as has happened frequently this season, struggled in the third period. The Eagles took advantage of a Crook County scoring drought to regain the lead. Outscoring Crook County 13-7 in the third, Hood River Valley took a 30-29 lead into the final period. "We still got outscored in the third quarter," Lea said. "It was better, though. We played a good second quarter and even the third quarter, we did get outscored, but we still competed." A Josie Kasberger offensive rebound and basket gave the Cowgirls a 31-30 lead early in the fourth. However, a Bailey Frazier three-pointer gave the lead right back to the Eagles. "Josie is stepping up big," Lea said. A driving basket by McKinzee Mode tied the game at 33 apiece, before the Cowgirls took the lead for good. First, Heather Ptomey made a five-foot jump shot, then Dallas Hutchins hit both ends of a 1-and-1, and the Cowgirls were up 39-33 with three minutes left to play. "Heather's an unsung hero," Lea said. "She does the little things. She just does her job down there, and she scored a couple of baskets tonight and that's a bonus when she scores because we don't normally look to her for scoring." With both Liz Barker and Hutchins fouling out in the fourth quarter, the Cowgirls would score just one more basket down the stretch, a clutch 10-footer from Freeman with just over a minute remaining that put Crook County up 41-38. "This night was for Michelle (Crook County principal Michelle Jonas, who is currently battling breast cancer) and it felt good 'cause we did that win for her," Freeman said. "And the team needed that win too, so it was a good night." Trailing by three late, the Eagles went to the strategy of fouling, and Crook County struggled with free throws, missing the front end of a 1-and-1 three times in the final minute. Still, the Cowgirls played tough defense and did a good job of rebounding the ball. When McCall Woodward missed a free throw with under six second to go, Kasberger and Ptomey fought for the ball, eventually knocking it out to where Woodward picked it up and ran out the clock. "It was very intense for us," Freeman said of the last minute of the game. "All of us had to just tell each other to calm down and to take it slow, and no matter what, to just play the game and not throw the ball away." Freeman led the Cowgirls in scoring with 10, while Hutchins finished with nine, Kasberger eight, and Mode six. Haylee Baker led the Eagles in scoring with 10, while Valle added eight. "I thought that Teagan did a very good job of controlling the ball at the end and bringing it back out," Lea said. "She likes to shoot, and we were trying to rein her in. She kept her composure and ran it, and we got the people we wanted to the free-throw line, they just couldn't hit the shots." Kasberger also led all players with 10 rebounds, while Mode pulled down eight, Ptomey seven, and Hutchins six. Kaitlyn McNerney led the Eagles in rebounding with nine. Neither team shot well from the free- throw line with the Cowgirls going 4-for-18 and the Eagles 5-for-20 in the game. With the win, the Cowgirls improved to 1-3 in Intermountain Conference play and 2-14 overall, while Hood River valley fell to 2-16 overall and 0-4 in league. Crook County is back in action on Tuesday when they play at Redmond (10-7, 4-0) in a 6 p.m. contest. 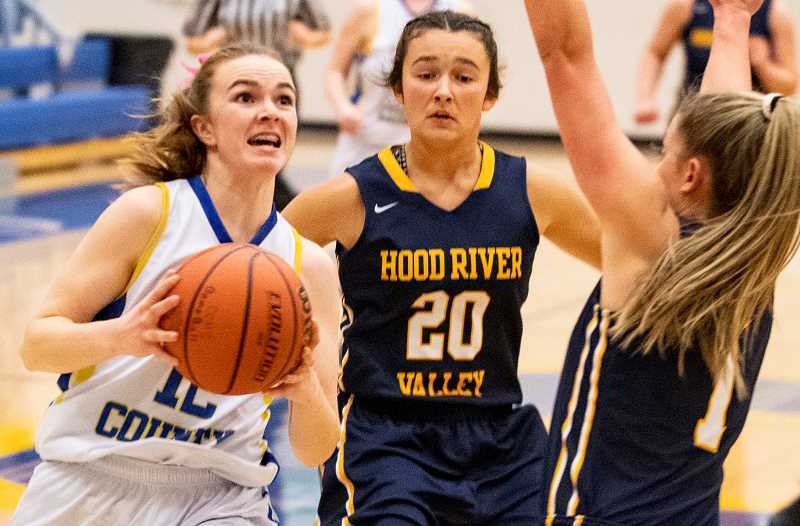 Hood River Valley – Haylee Baker 10, Valle 8, Frasier 6, Rouston 6, McNerney 5, M. Baker 4. Totals: 14 5-20 39. Crook County – Teagan Freeman 10, Hutchins 9, Kasberger 8, Mode 6, Ptomey 4, Barker 2, Woodward 2, Guthrie, Ossenkop, Ramoss, Brooks, Papke. Totals: 17 4-18 41. Three-point goals – Hood River Valley: Valle 2, Frazier 2, H. Baker, McNerney. Crook County: Freeman 2, Hutchins.